Snapchat’s text, video, and phone chat features allow you to support customers in the format they prefer. 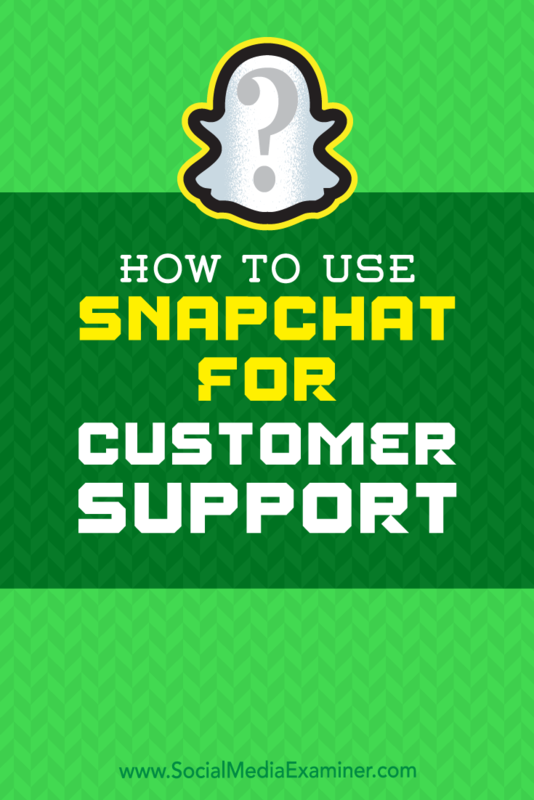 In this article, you’ll discover how to use Snapchat features to provide helpful and engaging customer support. 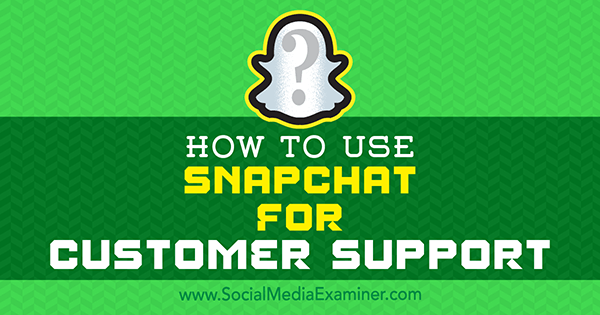 How to Use Snapchat for Customer Support by Eric Sachs on Social Media Examiner. Why Use Snapchat for Customer Support? Impress customers with a quick response. When customers typically expect a response within an hour, it may not matter if your support details last only a day. Reach customers where they are. Offering customer service on Snapchat may seem redundant if you already offer email or chat support. However, more than 60% of Americans between 13 and 38 are Snapchat users, and 45% of users are between 18 and 24. That same demographic on Facebook is just 16% of users! Keep negative comments private. Although your Snapchat profile may be public so customers can contact you, Snapchat allows companies to address customers’ concerns in private conversations. 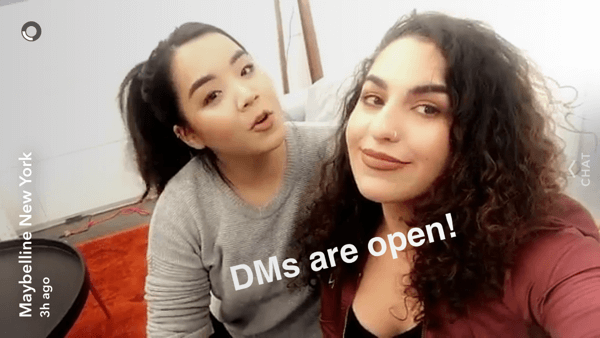 At the end of their Snapchat story, Maybelline encourages fans to message them. Your Snapchat settings control who can contact you via the platform. Before you start offering customer service via Snapchat, you need to make sure customers can contact you. Open Snapchat and tap the ghost at the top of your screen. Then tap the gear-shaped settings icon in the top-right corner. 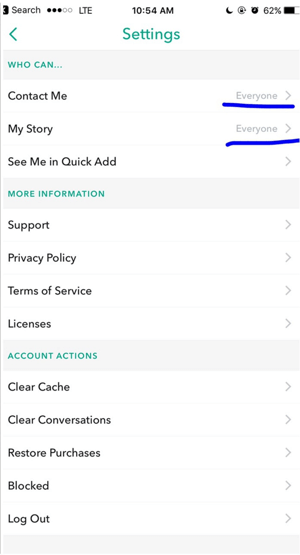 To offer customer service on Snapchat, access your settings to allow everyone to contact you and view your story. After you scroll down to the Who Can section, make sure you’ve set both Contact Me and My Story to everyone, so that customers can contact you. Change your Snapchat settings so anyone can contact you. When you’re ready to begin offering support on Snapchat, post an announcement on your story, encouraging people to ask you questions. As customers contact you, you don’t need to add every customer back. (That would fill up your contact list!) If someone messages you privately or responds to your story, you can offer support via photo, video, text, or even a phone call. With Snapchat’s Video Chat feature, you can offer face-to-face customer service or troubleshooting. For example, iOgrapher CEO David Basulto, who designs iPad and iPhone accessories for filmmakers, saw on a Snapchat video that a new customer had plugged in his cables backward. After Basulto helped fix the problem, the customer tweeted about the awesome customer service. To use video chat, you and your customer need to have the Snapchat app open at the same time and be in the same conversation. To set up the conversation, you can use the Text feature to set up a time for a video chat and ask the customer to confirm the appointment. Then, when both you and your customer are in the same conversation, tap the video camera icon on the bottom row to begin a video call. Use video chat when things are difficult to explain or demonstrate with a phone call or written message. To make a Snapchat video call, tap the video icon in your open conversation with a customer. Birchbox, a monthly subscription service for makeup and beauty products, tested Snapchat’s Phone Call features last summer for customer service. After inviting their followers to call, they received around 30 calls in an hour and talked about makeup tips, product recommendations, samples customers had received, and questions about signing up for a subscription. The trial run with Snapchat phone calls was so successful that the Birchbox team began scheduling regular call times. Even better, the company found that the Snapchat calls encouraged their Snapchat followers to actually sign up for a Birchbox subscription. 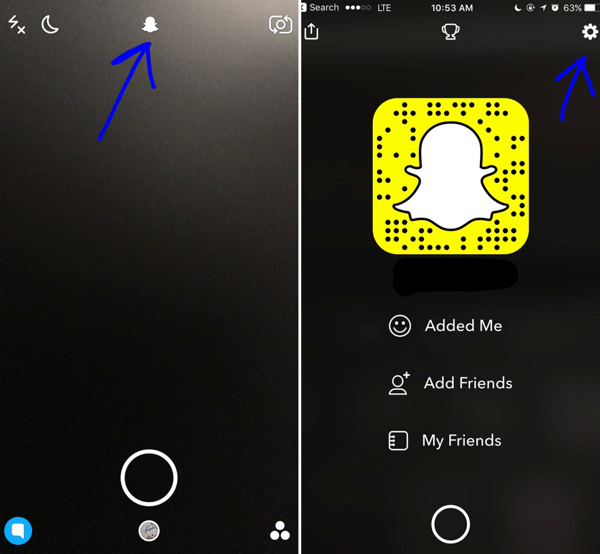 To make and receive phone calls via Snapchat, go to a conversation and tap the phone icon on the bottom row. If the recipient has notifications enabled for Snapchat, they’re notified of your call no matter what they’re doing. If notifications aren’t enabled, they see the call only if they’re using Snapchat at the time. 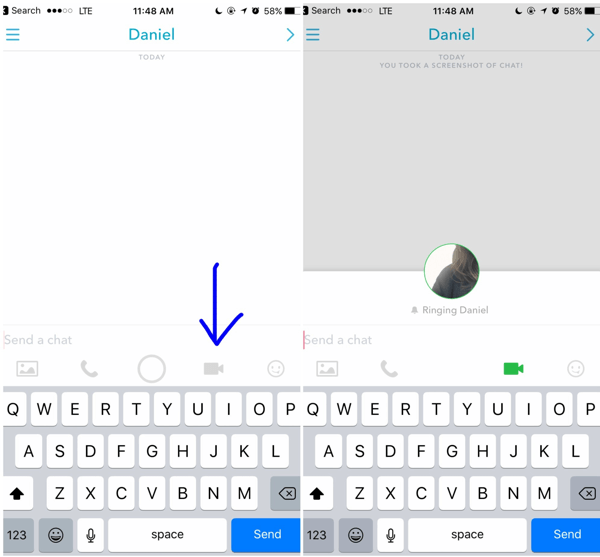 If you miss someone’s question or want to leave a more personal answer for the next time they log into Snapchat, press and hold down the phone icon to leave an audio message. After you’re done recording, the message is sent to the chat conversation. 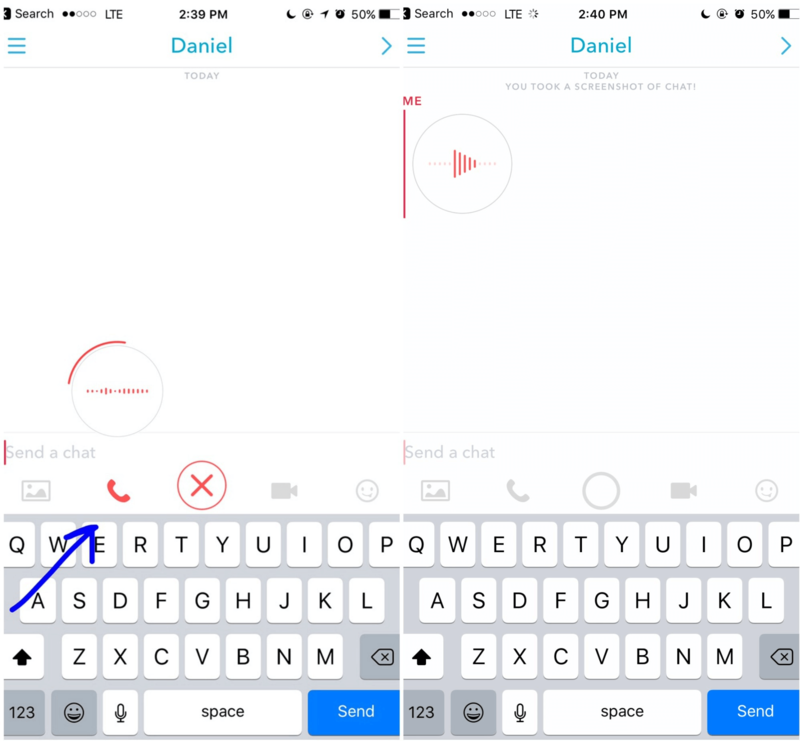 In Snapchat, hold down the phone icon to record a voice message that your customer will see the next time he or she logs in. Tutorials are a popular way to offer customer support, and Snapchat can make tutorials fun and interactive. For example, followers can pick what products your tutorial features. To survey your followers, ask them to screenshot one of several options. Then before the story expires, feature the option with the most screenshots in your tutorial. Urban Decay used a Snapchat survey to ask followers which makeup products were their favorites. A makeup artist then applied the winning products to a model in a Snapchat tutorial. 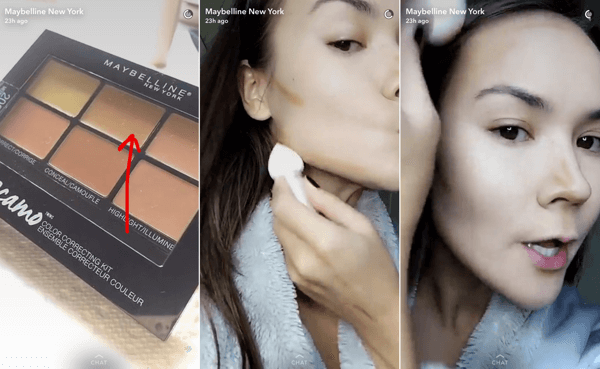 You can also employ influencers in a Snapchat takeover, like Maybelline did with beauty blogger Maryam Maquillage. Maryam logged into Maybelline’s Snapchat and gave a makeup tutorial to their followers. Then she answered questions about Maybelline products, like what her favorite Maybelline mascara is. A Snapchat tutorial can feature an influencer who also answers questions about your products. To share the actual tutorial, use the Video feature. Your videos are limited to 10 seconds, which is perfect for answering quick questions. Or you can string together multiple clips to walk people through unboxing, setting up, or using a product. The best part is that you can save each Snapchat video and repurpose it. For example, post a Q&A with frequently asked questions (FAQs), or a tutorial on a newly released product on Facebook or YouTube. Or archive a Q&A video on your website’s FAQs page. You could even use your saved video to give a personalized response to a similar question posed on a different site. Just because content on Snapchat is temporary doesn’t mean it can’t provide value to your audience. If your audience is already active on Snapchat, try using these techniques to make customer service more interactive and reach customers who aren’t on Facebook or Twitter. What do you think? Have you tried using Snapchat for customer support? Which of these techniques could be a good fit for your customers and products? Please share your thoughts and tips in the comments.